Indulge. Play. Discover. Reconnect. Renew. It’s time you push pause and treat yourself to a magical getaway, changing the way you see your day to day life. Welcome to Mind Body Soul – Surf Bali Retreat, we specialize in surf, yoga and wellness holidays in Bali and would love for you to join us for some fun, sun, ocean & good vibes. Our family run retreat is a personal experience designed with lots of love for people just like you. Connect, create and flow thru your days to the Balinese rhythm of life in your home away from home. Our boutique styled retreat offers stylish villa accommodation, food, surf, yoga, meditation, mind body soul treatments, sightseeing trips and lots of time for you. Relax, re-energize, learn something new and find your way back to a happier and more connected self. 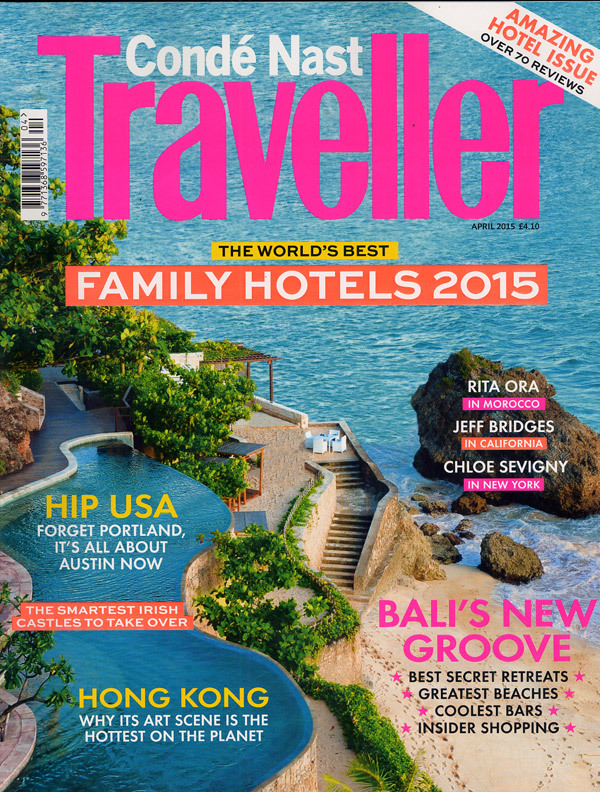 Our home, Bali, is the perfect destination for a retreat of this kind. The beautiful beaches, amazing waves, five star spa sanctuaries, breathtaking views and special healing energy await you. Open heart and mind, welcome new perspectives while tuning into your wellbeing by experiencing one of the most memorable holiday adventures ever. 5 Star Awarded Trip Advisor – Mind Body Soul Surf Bali has 7 years of retreat expertise & countless happy clients and transformation stories. 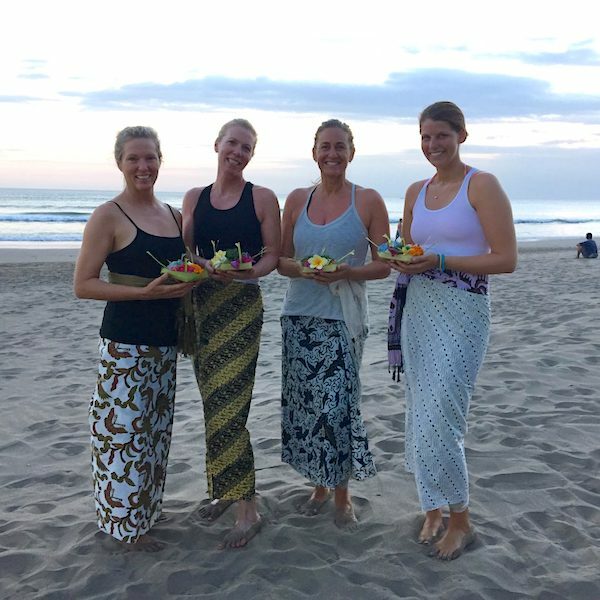 We add value to people’s lives thru what we do by sharing in our teachings (years of knowledge and experience) and invite you to have an amazing time with us in Bali. Meet like minded people from allover the world. Our retreat weeks are a perfect surf & yoga getaway for anyone traveling solo, with friends or family. Surf and yoga are perfect complements, preparing and rejuvenating tired and sore muscles. Learning to surf gives a sense of accomplishment, developing a deeper trust within. Surfing accompanied with yoga strengths and aids this process in reaching a restored balance. Your days with us are filled with surf lessons, yoga and meditation classes, nourishing meals, relaxing massages, beautiful sight seeing tours and time to unwind. End your days with stunning beach sunsets, laughing and sharing with new found friends. 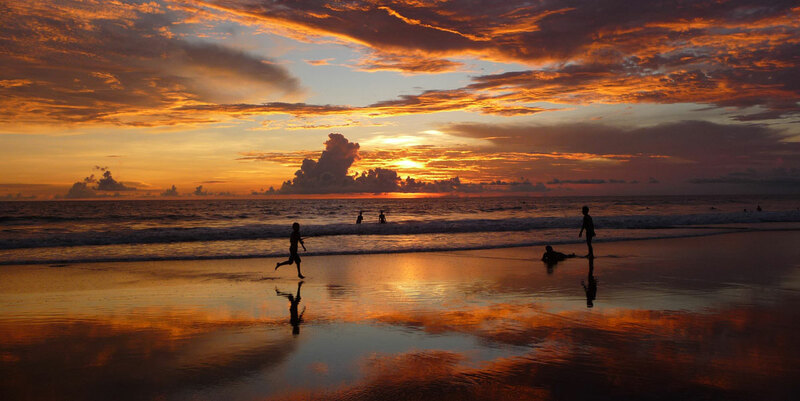 We help you plan your itinerary, organize drivers for culture trips, set up appointments, provide a long list of things to do in the area, restaurants and bars to visit and our must see place around Bali. There is nothing we can’t help with to make your stay with us run as smooth and as relaxing as possible. We have a huge network of experts in the health, travel and sport sectors that we trust and can connect you with. Join us in a boutique retreat incl. surf, yoga, wellness, food. Experience the benefits of surfing and its positive influence on life and wellbeing. Be part of the power of the collective and sharing this experience with like-minded women from all over the world. Choose a package that suits your wishes and pick your travel dates to fit your schedule. Come and relax, hit the yoga mat, play in the ocean and discover Bali's best kept secrets with us. Join our 7 day all inclusive women's wellness retreat which includes surf, yoga, meditation, wellness workshops, nutrition and many more activities focused on renewing and reconnecting to mind, body and soul. Our retreat itineraries have a harmonious balance of fun and adventure coupled with rest and reflection. We have created an uplifting retreat environment to learn to surf or deepen your yoga practice with the best instructors in Bali. Absolutely loved my stay here. This is a gorgeous family run retreat in Canggu; beautiful people, delicious fresh food, clean rooms, nice pool. Wonderful Sarah and Made are amazing hosts. I was really well looked after throughout my stay, getting everything organised and changes in my plans managed seamlessly. 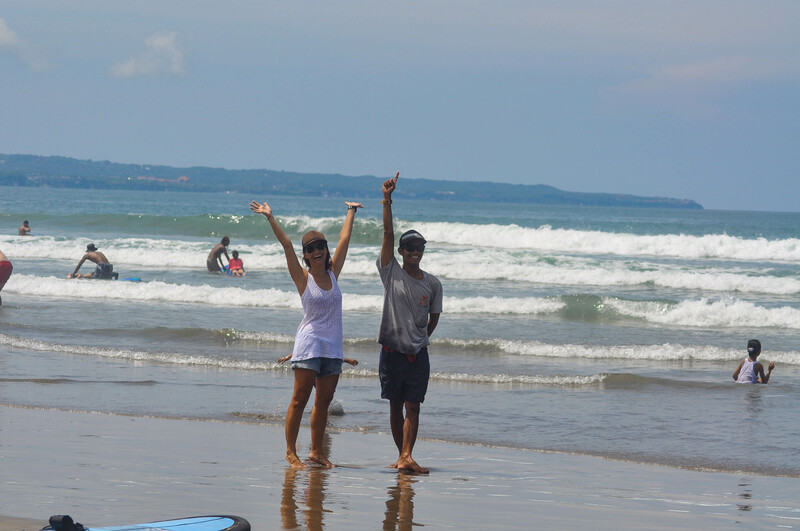 A perfect balanced combination of surfing, yoga, messages, Bali exploration and chillaxing. The surf areas were away from the big crowds and the instructors are very motivated to get you the best possible surf experience according to your skills and to help you progress and develop further. The patient instructors constantly keep a safe eye on you, help you in the line up and give valuable feedback. 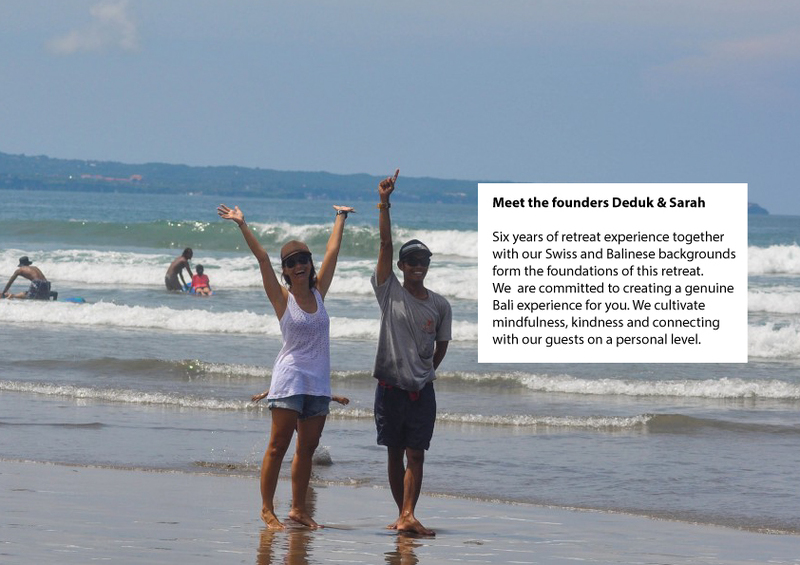 A special thanks to Deduk for the amazing experience at Kuta Reef – will never forget! Yoga in beautiful salas and massages in the room were amazing. I also had great opportunities to experience and learn about the authentic local culture. THE TOP WELLNESS TRENDS OF 2019 ARE HERE!